This article provides information on how to block calls and faxes on your Office@Hand Online account. Blocking telephone numbers allows you to filter and choose who can call you or send you a fax. It is a good way to prevent unwanted calls and spam messages. 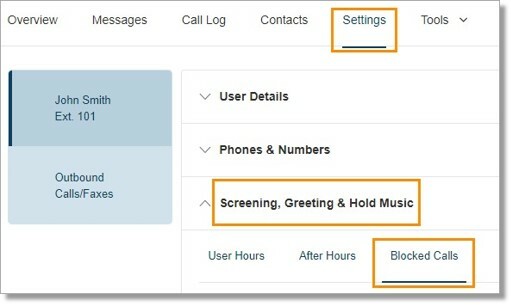 Go to Settings > Screening, Greeting & Hold Music > Blocked Calls. Select this option if you want to prevent certain numbers from calling you. Enter the Phone Numbers or Area Codes and Name in the respective fields under the Only block these numbers or area codes fields, and then click Add. You will not receive any calls unless you specify allowed numbers. Use block all calls if you only want to allow calls from a few specific area codes or numbers. If you block all calls, you can specify the exceptions of which calls you wish to allow below. Enter the Phone Numbers or Area Codes and Name in the respective fields under the Allowed numbers and area codes fields, and then click Add. 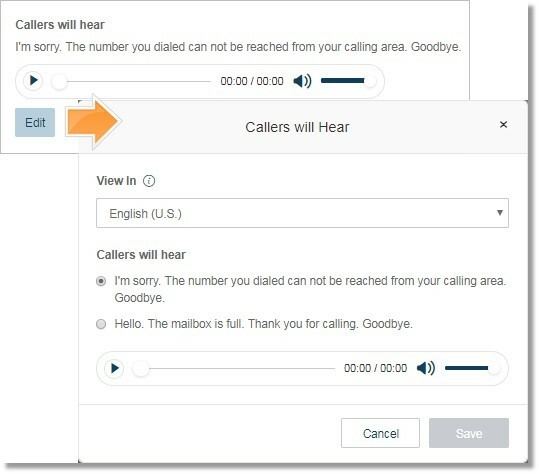 Configure what blocked Callers will hear. Click Edit to select your own language to display the default greeting text and then click Save. Note: Your selection here affects only your current view of the greeting text, it will not change the Greetings Language setting. Configure Block calls with no caller ID. You may block None, Calls and Faxes, and Faxes. Note: Skip this step if you select All Calls as a Block Option for Blocked Calls. Selecting either Calls and Faxes or Faxes allow you to configure what blocked pay phone callers will hear. Click Edit to select your own language to display the default greeting text and then click Save. Block calls from pay phones is enabled by default. You may also configure what blocked pay phone callers will hear. Click Edit to select your own language to display the default greeting text and then click Save. 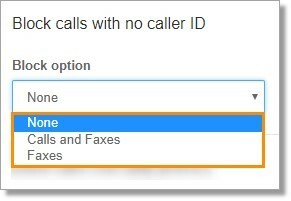 To disable Block calls from pay phones, un-click the checkbox and click Save. 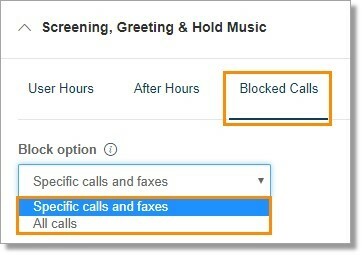 QUICK TIP: To block calls and faxes on another User’s Online account, go to Screening, Greetings & Hold Music – Block Calls and Faxes | AT&T Office@Hand.